Whether you are driving within the city on tarred highways, traveling from one state on outback roads, or driving through mud and sloppy mountains, a professional diesel engine tune will ensure you enjoy a smooth driving experience. Flash Diesel is specialized in providing excellent diesel tune service for your diesel engine vehicle, as well as diesel upgrades of your engine components. Our goal is to help all diesel vehicle owners in Australia get more power and torque, and decrease the fuel consumption of their vehicle. 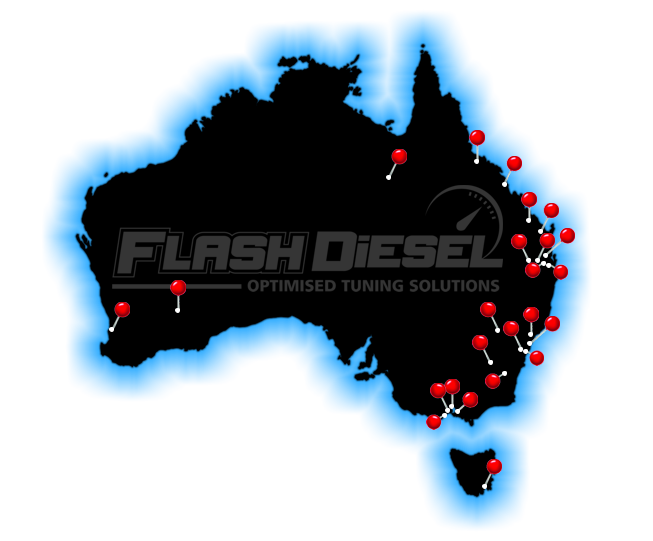 We understand that Australia is a large country, and so our diesel tuning dealers are located in strategic towns and cities all over the country. From the suburbs of Queensland to the small industrial estate of Mitchell in the Australian Capital Territory, you will be sure to find one of our diesel tuning dealers to help improve your vehicle performance. Each of our diesel tuning dealer shops is equipped with the latest modern diesel tuning technology and equipment. Furthermore, the technicians stationed in each dealer shop are highly trained and experienced professionals, who will provide you with an outstanding diesel tune and upgrade service that is customized to suit your needs. tuning services in your neighbourhood? Check out our dealer shop list, and contact a Flash Diesel tuning dealer nearest to you today!